Blogging Beautifully: 2 Months of Stress. I'm very aware I have been somewhat absent from the blogging scene of late. Sometimes life takes over and motivation dwindles. I've lost my zen. My sparkle has been dulled somewhat in the last few weeks. I don't even know where to begin so bear with me. It's been a crazy few weeks and I fear it's taken it's toll. This post is going to be a bit of a brain fart I'm afraid, I have alot to write and it may just come tumbling out. I want to take you back to the end of February. Seems so long ago doesn't it. To me it seems to have been a slow process of weeks, the hours turning into days and days turning into weeks. More than once I have felt like banging my head against a brick wall......in fact on some occasions I feel like I almost have been. It was a Friday night when we found the lump. A hard, yet mobile lump on Elarna's neck. She was absolutely fine in herself but prior to finding it she had the usual toddler snuffles and a temperature days before. I'm lying if I said I didn't panic, of course I did, but on further palpating it I felt fairly confident it wasn't anything sinister, mainly the fact that we had not felt it previously and all of sudden it was there told me that it was not a tumour or similar. Still, didn't stop having worries about it. Bizarrely even being a Nurse I felt I needed some reassurance so I rang 111 that evening, what a waste of time that was won't be calling them again in a hurry. Contact the GP in 3 days....marvellous as if I wouldn't bloody do that. So Monday came around and the lump was still there, it didn't seem to be overly bothering her which was good, she seemed well in herself. Off we went to the Dr's (after waiting about half an hour to get through on the phone), the Dr was a locum we saw. He was ok, had a good feel of the lump, took her temperature and basically told us he wasn't too sure what it was but she needed an ultrasound to rule out anything sinister. Great. Worrying again. He sent us on our way with no antibiotics, no blood tests or anything else while we were waiting for the scan. Thankfully, the ultrasound was booked quickly as he did put it through as urgent so she had one in less than a week. This came back to show that it wasn't anything sinister (thank fook) but what the Consultant thought was an abscess over the lymph nodes. He advised me to take her back to the GP for a follow up and queried why she wasn't already on antibiotics. He also said if it didn't clear up she may need hospital treatment for IV antibiotics. More stress. What the abscess started to look like after a few weeks. The next week it was another trip back to the Dr's, the lump was starting to change shape and becoming bigger, we saw yet another Locum, so we had to go through the whole process of explaining everything again. At this appointment she did have a temperature and was given a course of antibiotics. Fast forward a week and the antibiotics had not worked and the lump was still getting bigger and Elarna a little less happy. We decided at this point we wanted to get a 2nd opinion (well more like 4th if you count the amount of people we had seen) and since my husband has private healthcare we decided to go down the private route and see what was said. After seeing yet another GP at our Dr's and to be told it would 'probably' just resolve itself we needed to take a different route. We now know that actually this wasn't something that would resolve itself and surgery really was our only option. However, trying to get an 'open' private referral from our GP was a joke. In the meantime there was also an NHS referral in place for her to be seen by the Paediatricians also. I don't want to ramble on too much, I know I have an tendency to do so. In a nutshell the lump continued to get bigger and became much more abscess like, it looked ready to burst and angry. 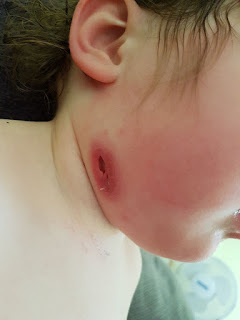 We ended up going to the out of hours one evening as it looked so nasty, they ended up prescribing yet more antibiotics and telling us to push through the referral to the Paeds. So I did and we ended up seeing a lovely Consultant at the hospital (NHS) who then took us to the children's assessment unit. She had a little cannula fitted and finally someone took bloods to check her levels and if anything more was going on. I was on that assessment unit for nigh on 8 hours.......it was not fun. They were amazing on there but it was a verrrry long process. We had to wait for the bloods to be developed before we could even see anyone from ENT (ears, nose and throat) as they had requested. Adi was due back at work so I ended up staying on my own trying to entertain an almost 2 year old who just wanted to run around. We were finally discharged in the evening after being advised that the ENT consultant was not going to do anything at this stage. We were exhausted and starving and a little peeved that we had waited that time to be told that they would not be doing anything. We also at this point had an appointment booked with a private Paediatrician so the NHS Dr told us that it would be good to keep it in place. No one was really sure what it was, we were told that it was likely to be caused by an atypical bacteria, which basically is a bacteria that is often non responsive to antibiotics.....I think I've explained that correctly in simple terms! So we had our private Paeds appointment, we had issues trying to get appointments as not many Paeds specialists work in the private sector local to us, but we did and the specialist we saw said a similar thing that the NHS Dr had advised, an abscess but unsure what has caused it. He gave us a couple of options. 1/ It's likely to burst, it should resolve in time but could take up to 18months and is likely to be leaky over this time and it could scar. 2/ We could get a surgical opinion and see what they say as they may have different thoughts on it. Seen as we had already paid for the private referral we figured we may as well see what the surgeon thought so we decided to go ahead with an appointment. We were booked for March 20th to see the Surgeon in Leicester. The abscess had not burst to this point but it looked awful and I felt so sorry for my little girly, it was clearly bothering her and painful and I'm not surprised to be honest it was quite large at this point. The 15th came around, her birthday. We celebrated the week before and thankfully because she is little she was none the wiser. We had to be over at Leicester for 7am, Alfie had a sleepover at his Grandma's so we could focus on Elarna. We arrived at the Nuffield in plenty of time ready for her op. It was when we got her in the room it dawned on his just how worried we were. She looked so little sitting on this huge bed, dressed in her pj's.....so innocent and unaware. I just wanted to get it over with, thankfully because she was the youngest there she would be having her surgery first. After seeing the anaesthetist and surgeon we were soon called to take her down to theatre. I carried her down, we both were allowed with her which we were pleased about. I held her so tightly while we were going to theatre, my stomach was in knots, I felt a little sick. I was taking in her warmth and her smell. I knew it wouldn't be long before we saw her but I wanted to just squeeze her and cuddle her before leaving her in the hands of the staff. I sat with her on my knee while Adi distracted her while they were putting her to sleep, they used gas and literally waved it in front of her face. I didn't even realise she'd gone to sleep. That was it, we gave her a kiss and left her all little and vulnerable on the bed. God I can't even begin to tell you how it felt. Adi said he was pleased I held her, he said he watched her eyes roll back in her head and he felt horrible watching it. We were both a little emotional but we held it together. We were shown back to the room where we tried not to clock watch too much. It was an anxious wait. The Nurse popped her head around the door an hour or so later to tell us we could go to recovery and get Elarna. Thank god. I was asked to get into bed with her, she was just coming around from the anaesthetic. It was awful, they had sort of said she would be confused and disorientated but I wasn't prepared for just how bad it was. She was thrashing around, writhing against me calling out Mummy and Daddy and crying. It was freaking awful. I almost found this worse than the anaesthetic. She did this for quite some time and I suggested that Adi got into bed with her as I was struggling to hold her securely. I've always found with my 2 that they sit with Daddy and calm, I think because he's warm with a strong heartbeat it relaxes them. Within about 15-20 minutes she was getting tired and fell asleep against his chest. She was in a deep sleep for a good 90 minutes, I kept checking her and the Nurses kept popping in and out. When she started stirring we were of course worried she would be possessed again but thankfully she wasn't. She was back to normal, it was incredible really, kids do seem to bounce back incredibly well. She was out of the bed and wanting to play and dying for some food. She hadn't had anything since the evening before so was ravenous. After stuffing her face with some pasta she just didn't want to sit around and we ended up taking her to the playroom. It was about 12:30pm when the Nurse said we could go home.....I couldn't actually believe we were going to be allowed home so soon, absolutely brilliant. Within about 45 minutes we had our paperwork, Elarna had her final checks and her cannula out and we were on our way home, it was so nice to know we would have the afternoon at home to celebrate what was left of her birthday. We got home and had a little wait for Alfie to come home but when he did we had tea and had more cake (Elarna's fav food!). After putting them to bed Adi and I had a quiet evening and an early night, I was shattered! Fast forward a couple of weeks and now I can report that Elarna is making a great recovery. We did have a set back a few days ago and sadly her wound became infected, poor little love. After a trip to the out of hours Dr and some antibiotics I finally feel that she has turned a corner and are now healing. She seems happier, her neck looks alot better.....all be it with a bigger scar than we anticipated as unfortunately they had to remove more lymph nodes than planned as the mass was bigger than they originally thought, but you can't actually see it at all from the front and hopefully in time it will fade well. I am really sorry for the length of this post. I wanted to write it all in one go rather than split it up as I needed to get it off my mind. It's truly been a horrible and worrying couple of months. I wasn't sure whether I wanted to write about it but then I wanted to explain why I've been a little quiet on the blog front and as this blog is family based I figured I should off load here. So if you've made it this far thanks for sticking with me and reading all about how the last couple of months has been. Hopefully the rest of 2017 which be a little kinder to us. Aww! Bless you! Sending big hugs! Glad she's on the mend and that you were able to get things sorted. Sending hugs and tea to you all. OMG kids are so freaking scary. Thinking good thoughts for you and your family. That was a stressful two months, so glad it's over and she is getting better. Hugs to you and hope you get your zen back soon. Wow I can see why you have been so occupied! Poor little lamb!